What is keratosis of the skin and how to cure it? Keratosis of the skin, skin tags and other growths are very common among the population, they are usually not dangerous, but nevertheless, they should not be ignored, because some of them can become malignant. On our skin during life appear different, mostly benign growths, whose position on the body and the number varies from person to person. There is always a fear that every bump on the skin is the way to the worst case scenario. Some skin lesions, pigmented or not, can be a risk to health and, therefore, doctors recommend regular check-ups. More about fibroma and keratosis of the skin, what are the most common causes of their occurrence, and how to remove them, find out more in this article. The most common skin lesions are keratosis, which can be seborrhoea and actinic. Both of these occur in the elderly, although in recent years it occurs in younger people, because many of them are exposed to uncontrolled sunlight or go to the solarium too much. Seborrhoea keratosis on the skin usually occurs on the face, chest, back, stomach, under the breasts in women, as well as on the scalp. Initially they are slightly above the skin level, yellow or light brown, and later become dark brown or black, the surface becomes rough and they are often covered with fat flakes that are quite easily removed. 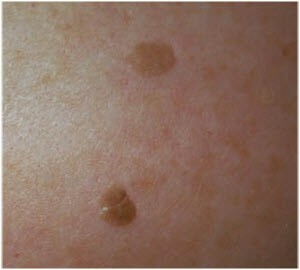 Appearance of keratosis may vary, they may be a few millimetres in diameter, although the size can reach to an inch. New growths constantly appear, so one person can have dozens of them, even hundreds. Today, the removal of keratosis is successfully done with liquid nitrogen or electrocoagulation. These skin growths are benign, but can become malignant. Often they are seborrhoea keratosis on the skin localized under the breasts, and are accompanied by itching, redness and subsequent maceration and secondary infection, especially in the summer months, due to excessive sweating in people with excess weight. If you during the summer have troubling growths on the skin that itch, it is most likely this problem and you should definitely visit a dermatologist. What other kids of growths can occur on the skin? There are different types of growths, and most often it comes to the keratosis, moles, fibroma, papilloma warts of viral origin, which are not a major health hazard, although often constitute an interference - for aesthetic reasons or because of frequent injuries, when their removal is necessary. Actinic keratosis on the skin (solar or senile) is more common in the elderly with light skin and light eyes. They occur in people who were in the course of life exposed to the sun (the workers on the building, outdoors, etc.). The changes occur as a result of chronic influence of ultraviolet rays with cumulative effect. So most people who have these changes say they no longer sunbathe. However, they are not caused by the recent sun, but from the sun whom these persons were exposed to during childhood through to old age. The most common is solar keratosis on the skin which appears on the forehead, nose, cheeks, ear lobes, hands, outer parts of the forearm and the apex in people who do not have hair or are suffering from increased hair loss (alopecia). They look like a whitish-yellow flakes, which have a diameter of three to four millimetres up to one centimetre. There are more methods of treatment of these growths. It is known that after removing seborrhoea keratosis radio waves do not leave scars, possibly whitish coloration of the skin can be seen. Over time, individual skin growths gradually increase, increasing their total number. About 20 percent of them in a few years transform into a malignant tumour of the skin. The increase in individual growths, infiltration, creating ulcerations (sores) and reddening of the surrounding skin are signs that indicate malignancy, and should be treated in time. The treatment is carried out with liquid nitrogen, and there are creams for topical application. If for some time you have spots on the skin, be sure to contact a dermatologist, because it is better to remove them and not wait for them to be transformed into a tumour. The only preventive measure for all of these changes is to protect it from the sun and avoid the sun in the hottest part of the day, from 11 a.m. until 4 p.m. Growths renew, and people who are prone to these growths should constantly be under the control of a dermatologist. Basically, the review is necessary before the start of sunbathing (the end of winter and beginning of spring) and in the fall. If you have a coarse and rough elbows because of keratosis, once or twice a week soak them in a bath of almond oil with lemon juice. All you need is a suitable container in which you can put your elbows and hold them in the bath for fifteen minutes. Besides keratosis, frequent changes on the skin are small growths call fibroma. They usually appear on the neck, armpits and groin, but may occur on other parts of the body. They can have a skin colour, and can be light-brown and dark-brown. Fibroma is predominantly one to two millimetres in diameter, although it is not unusual for it to grow up to one centimetre, and even more. These growths like keratosis on the skin should be removed, and largely are eliminated electro surgically. With time new can appear, but those that are removed - generally do not appear again. There can be a lot of them or little of them and some people can have dozens and even hundreds of these growths on their body. Uncontrolled exposure to skin tanning is not harmless. The consequences can be the same as exposing yourself to the sun in the summer during the most risky part of the day, when the strongest UV radiation is present. The use of tanning beds for a longer term leaves unwanted effect. Over use leads to the formation of free radicals that destroy cells and cause skin malignancy. In addition, UV rays destroy immunity making us more susceptible to infections, even to the most banal ones. Therefore, it is very important to find the right balance, if you do not want to deprive yourself of this pleasure. We hope that you find out more about this topic, and if you notice any of these changes on your skin it is best to visit a dermatologist.